The Transit of Venus is one of the reasons modern Australia exists as it does. It’s not only of great scientific and historical interest, it is a significant part of the story of our country. So it’s a bit of a shame that more isn’t being made of it. 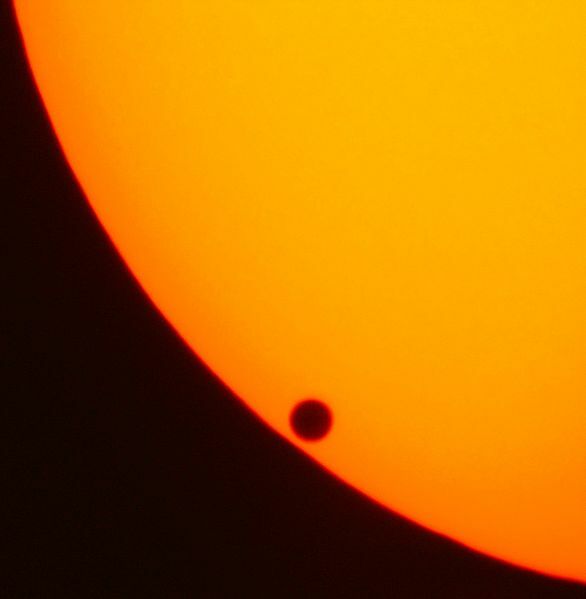 The Transit occurs when Venus passes between the Sun and the Earth. That makes the planet visible against the backdrop of the Sun. Transits of Venus occur in pairs eight years apart and then not again for another 105 years. This year’s transit is the second of the current pair, so it is the last chance most of us will have to see such a thing. Several centuries ago the Transit was supposed to be an effective way of calculating the distance from the Earth to the Sun. Measurements of the angles of sight as Venus touched the edge of the Sun taken from different points on the Earth’s surface could be used to calculate the distance. Calculating the size of the Solar system was important enough in the 1700s that several expeditions, including one led by Captain James Cook, were mounted. Cook’s role was to build an observatory on Tahiti. The expedition successfully observed the transit; but were, if the entries in their log books are anything to go by, not exactly stunned by the visuals. Unfortunately atmospheric interference meant that none of the expeditions’ observations were accurate enough to get a really precise measurement of the solar distance. Cook then opened his secret orders directing him to “search between Tahiti and New Zealand for a Continent or Land of great extent.” That, of course, lead to Cook bumping into Australia. So the Transit of Venus is a combination of rare celestial event, interesting science and maths, and significant Australian history – all rolled up into one. The 6th of June is the day you can see the transit with the same precautions you would take for viewing a solar eclipse. In my view every primary school should be doing this – what an educational opportunity! If you don’t want to view the transit in a home-made way you can book into the Sydney Observatory for talks, appropriate equipment and more. The early morning session when Venus crosses the edge of the Sun’s disc is likely to be the most obviously visually interesting.